Nike's Vapor Flash glows in the dark! I'm the type of person who forgets to write the new year on her checks and paperwork until February. So being that it's only the first week of January, I'm still in 2011 mode, recapping the past year before moving forward into 2012. One such stop: reading old magazines. I unearthed my December copy of Runner's World and realized I never unfolded the pages to look at the gear gifts by Sarah Bowen Shea (p. 100). And then I wanted to pick out my personal favorites from the last 12 months, the running items that found their way into my closet or wish list, even if they were released long before 2011 and my woman-behind-the-times status only recently caught on. Give me some credit, I had to do it before the latest and greatest for 2012 starts to hit the shelves. Garmin 310XT. It's old news that this Garmin GPS watch is water-resistant enough to endure a triathlon swim, but it's other bells and whistles left my 305 in the dust. The watch vibrates at every mile of a race (so what if it's sometimes short from the satellites) or training run to tell me my pace per mile, the data uploads quickly online (my 305 data seems stuck on the device, never transferring to the computer program), the swim can produce accurate data when you put it on the right setting, which I did...once. And it's less bulky than its predecessor. Nike+ Sportwatch GPS powered by TomTom. I may have ended up with a doozy of a device--my Sportwatch is currently in transit to Portland to be replaced after customer service was just as perplexed as I was with the data it was recording--but I love it anyway, especially when it does work. It's so easy to operate and starts up by pushing two buttons to highlight my preferred display. And I'd wear it for more than running simply because I love the sleek design. But better yet, I can't lose it as easily as I can my Sport Kit device that plugs into the end of my Nano--that's been MIA for months and I don't even know where to start looking for it. 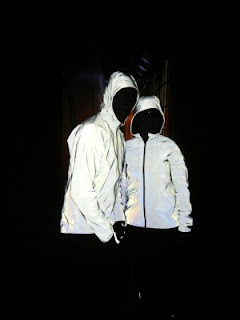 Nike Vapor Flash Running Jacket. Glows in the dark? Lightweight? Complete with a hood and pockets and it's reversible? Where do I sign up? If I could afford the $350 price tag, I would have added this to my brood months ago, mostly to be seen while commuting on my bike. Hey, I'd rather be blinding than blind-sided. Or as Fleet Feet Cleveland said, "Our joke here at Fleet Feet is that if you are hit by a car wearing this…it was on purpose!" Moji One. When you're ailing an injury or an ache, this Moji comes to the rescue. Not only does it work better than a bag of peas--if you even have peas in your freezer--but it won't immobilize you while you RICE. You can wrap this Moji tight around your ailing body part--ankles, shins and feet included--and feel that cold compress up close and personal. I'd like to think that helped my swollen, stress fractured shin look better when I was still healing but allowed to run short distances. Nathan Quick Draw Bottle. Water on-demand, with a spot for my keys when I forget to wear the gear with the key pocket. I might have my hydration timed by the water fountains along the Lakefront, but get me running in Wisconsin and I can't be without this bottle. Saucony Kinvaras. If I needed to walk anywhere this summer, I was tredding in either these or the Nike+ Frees. They were my first Sauconys that didn't feel uncomfortable underfoot--and apparently they're eye-catching since they sparked a conversation at the grocery store check-out. There's a reason these won multiple gear awards from the likes of Runner's World and Outside. Brooks Versatile Shorts. I don't wear shorts when I run. Period. That is, until I met this pair in October and we've been best friends ever since. They haven't chafed yet, they're a likeable length and they're a new reminder of an old pair of Target running shorts that I literally wore everywhere until I tore the side, catching it on the car seat. If I had been running instead of skiing on those post-Christmas warm days that fell upon the Windy City, these would have logged some serious miles on the Lakefront. Mizuno Inspire Graphic Tee. Maybe it's the color. Maybe it's the Japanese characters emblazoned across the front. Maybe it's the super soft material that's cozy on the skin. Whatever the case, I have to stop myself from wearing this T-shirt two days in a row--and that's not even while running. CW-X Stabilyx Tights. You might look like a stuffed sausage but it's worth it for compression on the run. Acquired just days before Thanksgiving--and what turned out to be my last race of the season--I yanked these suckers on for my Turkey Trot so I didn't sweat through the fleece lined pants I thought I'd have to wear to stay warm. But I liked them so much, and how they made me feel pain-free and cramp-free while running an 8K too fast for my untrained legs, that I didn't want to take them off. I'd like to think that the compression magically made me look like the svelte runner I'm normally not, but I'll pretend that they do. Craft Zero Extreme Long Sleeve. The ribbing on this mock t-neck baselayer features a special technology to really wick the sweat off the body, per the description Fleet Feet Sports Chicago owner Dave Zimmer detailed at the store's November fashion show. Personally, I was attracted to the longer length, the non-choking neckline and the warmth it would provide on the runs I tend to avoid come cold temperatures. MiCoach from adidas. You mean I don't have to beg someone to run beside me when I'm dragging? I don't have to hire a coach to push me to the next level? I don't have to look like a running sherpa wrapped in wires between this gadget, my Garmin, my SportBand and my iPod? Yep, that's why adidas's MiCoach, the personal, interactive, wearable coach is just too good. Maybe that means I'll finally run fast again in 2012? I hope so. What was some of your favorite gear from 2011? What gear was your go-to last year? Note: the Garmin 310XT and the MiCoach were not new releases in 2011. Photo provided by Lauren M at Fleet Feet Sports Chicago. Got Epic? Go Ski Big Sky--For Free!